*Based on CIPA Standards. 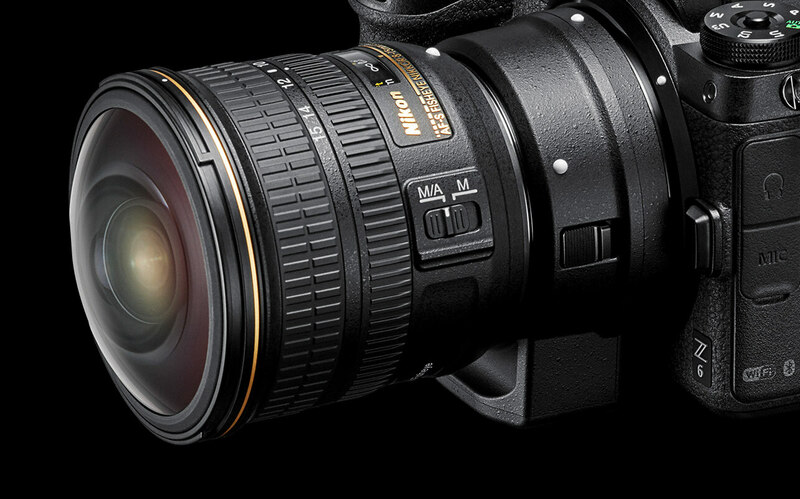 This value is achieved when the NIKKOR Z 24-70mm f/4 S lens is attached, with zoom set at the maximum telephoto position. Your favorite lenses now have VR*. For the first time, F-Mount NIKKOR lenses like the AF-S NIKKOR 105mm f/1.4E ED or AF-S NIKKOR 14-24mm f/2.8G ED can benefit from in-body3-axis VR. NIKKOR lenses that already have VR, like the AF-S NIKKOR70-200mm f/2.8E FL ED VR, get the added benefit of roll axis for a total of 3-axis VR. Just add the optional Mount Adapter FTZ and you’re good to go. A breakthrough in optical design. 17% larger internal diameter than Nikon’s acclaimed F Mount. Wider than any full-framemount available*. It totally changes what’s possible with lens design. Enhanced low-lightperformance. Even illumination from corner-to-corner. Maximum apertures as wide as f/0.95. Faster data transfer between camera and lens. This is the ideal balance between mount diameter, large image sensor and flange focal distance. Shoot up to 12 FPS at full resolution in Hi+ mode (12-bit RAW or JPEG) without the need for an external battery pack. When speed matters—and it always matters—you’ll catch the shots others might miss. The Z 6’s 24.5MP image sensor along with the Z Mount’s light gathering potential and flawless EXPEED 6 noise reduction free you to capture beautiful photos and videos at extremely high ISO settings—up to ISO 51,200 (expandable to ISO 204,800). A great advantage of a mirrorless design is the ability to shoot in near silence. Quietly capture important moments during recitals, weddings, newborn photography…anywhere silence is golden. Your smartphone is your favorite accessory. With SnapBridge version 2.5, you can also use your compatible smartphone as a remote monitor and controller. Touch focus, adjust settings like exposure mode, white balance and more, then fire the shutter. For the first time in a full-frame Nikon camera, you can charge the Z 6’s new EN-EL15b battery in the camera through a standard USB-C connection—from your computer, a wall outlet or other charging device. Already have EN-EL15a/EN-EL15 batteries*? They work with the Z 6, too. Requires optional EH-7P Charging AC Adapter. Camera cannot be used while charging via USB. 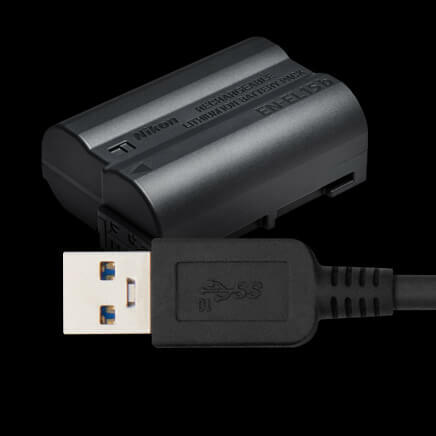 *EN-EL15a/EN-EL15 batteries cannot be charged in the camera via USB. Wire-free to a Mac or PC. 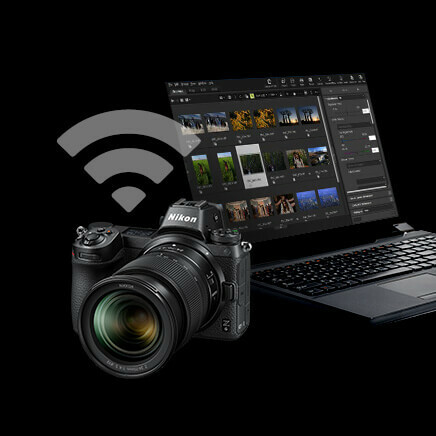 Connect to a Mac or PC over Wi-Fi and wirelessly transfer RAW, JPEG and movie files. Two modes available: Camera Access Point mode, for connecting directly to a PC, and Station (STA) mode, for connecting over a router. Wireless Transmitter Utility software must be installed on the computer. 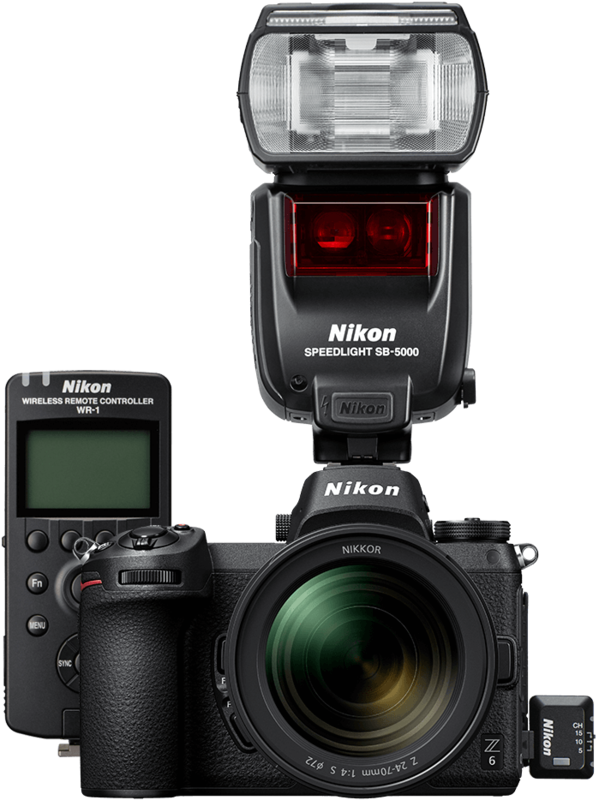 Take control of the light with any compatible Nikon Speedlight. Use the optional WR-R10 Wireless Remote Controller for wirelessly controlling SB-5000 Speedlights from another room, around corners or outdoors in bright sunlight. Advanced Wireless Lighting using optically controlled Speedlights like the SB-700 and SB-500 is also possible. For remote shooting, the WR-1 and WR-R10 Wireless Remote Controllers can be used. Create images with seemingly impossible depth of field using Focus Shift Mode. A new focus peaking feature helps confirm focus at each layer. The Z 6 is compatible with the best memory available today, XQD, superior to SD for its fast buffer clearing speeds and potential storage capacity. For tomorrow, it’s poised to also accept the emerging CF Express format with a simple firmware update. You name it. It’s got it. Need more? Focus Peaking, Slow Motion Video, WT-7 transferring, Advanced Scene Recognition, RAW Batch Processing, Square Format (1:1), Silent Interval Timer, Electronic Front Curtain Shutter, Silent Photography, Audio Attenuator and more.